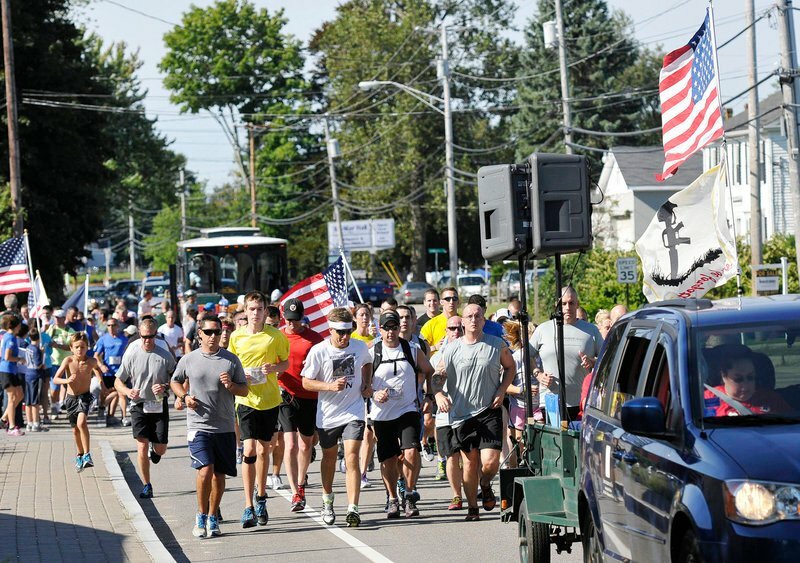 An annual run honors the 81 troops with ties to Maine who have died in combat since Sept. 11, 2001. The family of Sgt. 1st Class Shawn Dostie of Lewiston, who died seven years ago in Iraq, stood at a memorial set up in his honor long after the pack of runners left. The line of traffic that followed the Run for the Fallen up Route 1, honked and shouted out encouragement to the family as they passed the memorial at kilometer one. 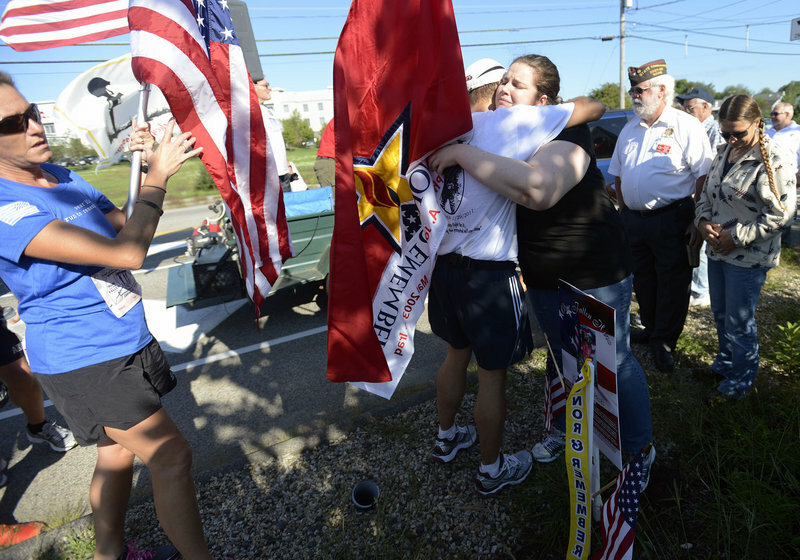 It was one of the memorials set up along the 65-kilometer run from Ogunquit to Portland to honor the 81 troops with ties to Maine who have died in combat since Sept. 11, 2001. 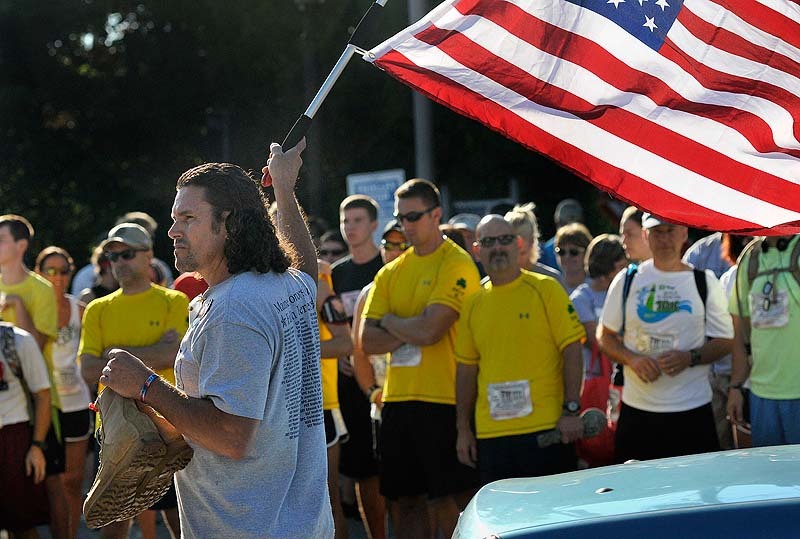 In its fifth year, the run benefits the troops’ families. Runners participating in the fifth Run for the Fallen make their way up Route 1 in Wells on Sunday. The 65-kilometer course stretches from Ogunquit to Portland. 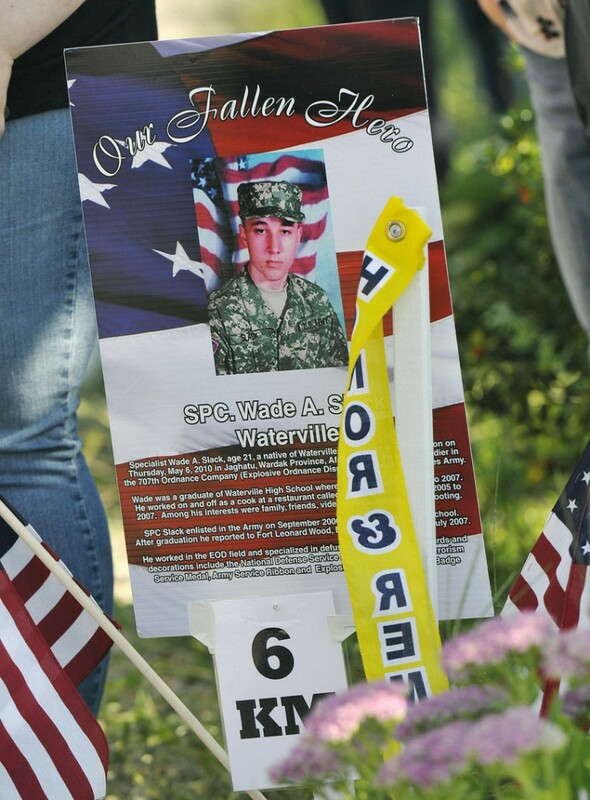 Kilometer six in Wells was dedicated to Army Spc. Wade Slack of Waterville, who died in Afghanistan in 2010. Runners stop to give Meghan Slack of Waterville a hug during the Run for the Fallen along the route in Wells on Sunday. Slack lost her brother Spc. Wade Slack of Waterville, who died while serving in the Army in Afghanistan in 2010. “It’s amazing, the turnout,” said Crystal Saucier of Sabattus . Family members said the event helps them cope with their loss. “It brings it back, but also shows us the support of the people,” said Robert Fugere of Sabattus, Dostie’s father. The runners were accompanied by three trolleys for those who needed a rest along the route and several Maine State Police cruisers. The race, mostly along Route 1, took about seven hours. The event debuted five years ago, the brainchild of John Mixon, an Ogunquit builder. Money raised in the run is for families of the soldiers killed in combat. Mixon said this may be the final year for the run in its present form. Crowds gathered to cheer the runners on, especially along the last five kilometers as the group headed up Broadway in South Portland, over the Casco Bay Bridge and onto Commercial Street in Portland. Participants and observers came from all over. Dan Fontaine, who works at Smith and Wesson in Springfield, Mass., an event sponsor, showed up with a group of his fellow workers. They said they were going to try to run the entire course, which is 40 miles. “It’s almost twice as long as the Boston Marathon,” Fontaine said. A group of 25 Army recruiters from across the state also made the run. “It’s a lot of fun, especially that last stretch near Portland,” said Staff Sgt. Patrick Kaufman. Laurie Nicholas of Gorham ran the course for the second year. “You run as much as you can and then jump in the trolley,” Nicholas said. She said the family members are very grateful. “It is one of the most meaningful things I have done,” Nicholas said. Carly Strabel of Rochester, N.Y., and her sister-in-law Kim Strabel of Jersey City, N.J., said they were vacationing in the area and decided to join the run because they have friends back home who have lost family members in Iraq and Afghanistan. “My fiance is a pilot in the Navy,” Carly Strabel said. Carlos Arredondo of Boston lost his son Alexander Arredondo, then of Bangor, who was killed at age 20 after two tours of duty in the Marine Corps. Carlos Arredondo’s only surviving child, 24-year-old Brian, then committed suicide in his grief for his brother. “It is very important to always remember what the siblings are going through,” said Arredondo, who waved the starting flag for the run. Cliff Paquette, of Sterling Conn., ran in memory of Arredondo’s sons. He is the director of the Connecticut Run of the Fallen, which took place July 28 over 63 kilometers. The family of Army Spc. Deon Taylor of Portland, who was killed in Afghanistan in 2008, traveled from New York. “It is a happy and sad moment, seeing all these people,” said Damarr McBean, Taylor’s brother.